Human Vα24+ NKT cells with an invariant TCR (Vα24-JαQ) have been shown to be specifically activated by synthetic glycolipids such as α-galactosylceramide and α-glucosylceramide in a CD1d-restricted and Vα24 TCR-mediated manner. We recently characterized Vα24+ CD4− CD8− double negative (DN) NKT cells using α-galactosylceramide-pulsed monocyte-derived dendritic cells. Here, we compare Vα24+ CD4+ NKT cells with human Vα24+ DN NKT cells from the same donor using α-galactosylceramide-pulsed monocyte-derived dendritic cells. Human Vα24+ CD4+ NKT cells were phenotypically and functionally similar to the human Vα24+ DN NKT cells characterized previously. Both of them use Vα24-JαQ-Vβ11 TCR and express CD161 (NKR-P1A), but not the other NK receptors tested so far. They also produce cytokines such as IL-4 and IFN-γ, and, in regard to IL-4 production, Vα24+ CD4+ NKT cells produce more IL-4 than Vα24+ DN NKT cells. The cells exhibit marked cytotoxic activity against the U937 tumor cell line, but not against the NK target cell line, K562. Although at least some of the factors responsible for the stimulation of Vα24+ NKT cells have been clarified, little is known regarding the killing phase of these cells. Here we show that the cytotoxic activity of Vα24+ NKT cells against U937 cells is mediated mainly through the perforin pathway and that ICAM-1/LFA-1 as well as CD44/hyaluronic acid interactions are important for the effector phase of Vα24+ NKT cell-mediated cytotoxicity against U937 cells. Although mouse Vα14+ NKT cells that express NK1.1 (NKR-P1B or NKR-P1C) and TCRs may play some important roles in the immune system (1, 2, 3), the details have remained unclear. Mouse Vα14+ NKT cells use an invariant TCR α-chain (Vα14-Jα281) that pairs preferentially with Vβ8, Vβ7, or Vβ2 (4, 5, 6). Phenotypically, there exist CD4+ and CD4− CD8− double negative (DN)2 Vα14+ NKT cells in mouse (7). The human homologues of mouse Vα14+ NKT cells appear to be Vα24+ NKT cells, because many of the features of mouse Vα14+ NKT cells are conserved in Vα24+ NKT cells. Vα24+ DN NKT cells express NK receptor, CD161 (NKR-P1A), and the TCR of the Vα24-JαQ invariant TCR α-chain that pairs preferentially with Vβ11 (human Vα24 and Vβ11 are homologues of mouse Vα14 and Vβ8, respectively) (8, 9, 10, 11). The functions of human Vα24+ DN NKT cells are similar to those of mouse Vα14+ NKT cells in many respects. Both have been shown to be activated by synthetic glycolipids such as α-galactosylceramide (α-GalCer) and α-glucosylceramide in a CD1d-restricted and invariant TCR-mediated manner (12, 13, 14, 15, 16). They exhibit cytotoxicity against tumor cells (17), which might be important for natural anti-cancer immunity. They also produce large amounts of IL-4 and IFN-γ (18, 19, 20, 21), which can potentially influence immune regulation such as determination of the Th1/Th2 profile. Regarding Vα24+ CD4+ NKT cells, Bonneville’s group has recently reported that Vα24+ CD4+ NKT cells are also recognized by CD1d-transfected HeLa cells pulsed with or without synthetic glycosylceramides such as α-GalCer (22). In this study, we compared phenotypically and functionally Vα24+ CD4+ NKT cells using α-GalCer-pulsed monocyte-derived dendritic cells (Mo-DC), with Vα24+ DN NKT cells derived from the same donor. We show that both Vα24+ CD4+ and Vα24+ DN NKT cells exhibit a marked lytic activity against the U937 tumor cell line, which is mainly mediated through the perforin system, and that adhesion molecules such as ICAM-1 and hyaluronic acid (HA) play an important role in the effector phase of this cytotoxicity. Moreover, we showed that these human Vα24+ NKT cells can produce large amounts of IL-4 and IFN-γ and that Vα24+ CD4+ NKT cells can produce IL-4 more than Vα24+ DN NKT cells can. The following Abs were purchased from Immunotech (Marseilles, France): IgG1 (679.1 Mc7), IgG2b (MOPC-195), anti-CD3 (UCHT-1), anti-CD4 (SFCI12T4D11(T4)), anti-CD8 (SFCI21Thy2D3(T8)), anti-CD40L (TRAP1), anti-CD44 (J.173), anti-ICAM-1 (84H10), anti-CD94 (HP-3B1), anti-CD161 (191B8), anti-Vα24 (C15), and anti-Vβ11 (C21). Anti-CD1d (51.1) was described previously (18). Anti-HA was biotin conjugated and purchased from Seikagaku Kogyo (Tokyo, Japan). Glycosylceramide (α-GalCer) was obtained from Kirin (Gunma, Japan) and reconstituted as described (12). A recombinant human (rh) GM-CSF was obtained from Kirin, a rhIL-4 was obtained from Schering Plough (Kenilworth, NJ), and a rhIL-2 was obtained from Shionogi (Osaka, Japan). Human Vα24+ NKT cells were established as follows. Monocytes from the peripheral blood of three healthy human donors were each cultured with rhIL-4 (400 U/ml) and rhGM-CSF (400 U/ml) for 5 days and used as Mo-DCs. Lymphocytes from the same donor were cultured with irradiated (50 Gy) Mo-DCs that were pulsed for 12 h with α-GalCer (100 ng/ml). After 7–10 days, Vα24+ cells were established by positive (Vα24) magnetic bead sorting (MACS, Miltenyi Biotec, Bergisch Gladbach, Germany) and were maintained in the presence of rhIL-2 (40 U/ml). The cells were restimulated every 7–10 days. When the cells were expanded, Vα24+ CD161+ CD4− CD8−, Vα24+ CD161+ CD4+, and Vα24+ CD161− CD4+ subpopulations were sorted using the FACS Vantage apparatus (Becton Dickinson, Mountain View, CA) and maintained in the presence of rhIL-2 (40 U/ml) and by restimulation every 7–10 days. Cells were analyzed by flow cytometry using a FACS Vantage apparatus. Immunofluorescence staining using specific mAb were performed according to standard procedures. Biotinylated anti-HA were visualized using streptavidin-PE (PharMingen, San Diego, CA). Total RNA was extracted from 1 × 107 NKT or T cells according to the manufacturer’s protocol (Tri Reagent LS; Sigma, St. Louis, MO) and reverse-transcribed using the outer primer of the constant region of TCR-α (antisense, 5′-ATACACATCAgAATTCTTACTTTg, CαO). Then the transcribed cDNA was subjected to the first-round PCR amplification using the outer primer of the variable region of TCR Vα24 (sense, 5′-TATACAgCAACTCTggAT, Vα24O) in a thermal cycler (RoboCycler; Stratagene, La Jolla, CA) under the following conditions: 94°C for 60 s, 50°C for 60 s, and 72°C for 60 s for 30 cycles. The second PCR was performed using the inner primer pair (sense, 5′-AAgCAAAgCTCTCTgCACATCACA, Vα24I; and antisense, 5′-gTCACTggATTTAgAgTCT, CαI) under the conditions identical with those for the first-round conditions. The PCR products were electrophoresed in 2% agarose gel and transferred to a nylon membrane. JαQ probe (sense, 5′-ACTCAgTTgACTgTCTggCCTgAT) was labeled by T4 polynucleotide kinase at the 5′ end with [γ-32P]ATP. Filter was prehybridized for 2 h at 42°C in 50% formamide, 5 × SSC, 5 × Denhardt’s, 0.5% SDS, and 100 μg/ml salmon sperm DNA and hybridized overnight at 42°C in the same solution with 32P-labeled JαQ probe. The filter was subsequently washed in 0.5 × SSC and 0.1% SDS for 15 min at 65°C and then was autoradiographed. For the detection of Vα-Jα sequence, the DNA band was excised from the agarose gel and DNA was extracted and purified according to the manufacturer’s protocol (QIAquick Gel Extraction Kit; Qiagen, Chatsworth, CA). Their nucleotide sequences were then determined (ABI PRISM 310 Genetic Analyzer; Applied Biosytems, Foster City, CA) by the dideoxy chain-termination method according to the manufacturer’s protocol with a DNA sequencing kit (Applied Biosystems). Proliferative response was assayed as follows. The bulk of 5 × 104 NKT or T cells as the responders and 5 × 104 irradiated allogeneic Mo-DCs (all allogeneic monocytes were derived from the same donor) as the stimulators in 0.2 ml of culture medium were seeded onto flat-bottom microtiter wells with or without α-GalCer (100 ng/ml). The culture was incubated at 37°C in an atmosphere containing 5% CO2 for 48 h. For the final 6 h of incubation, 1 mCi [3H]TdR was added to each well, and the incorporation of [3H]TdR was determined by liquid scintillation counting. To determine whether the response is CD1d restricted, MoAb 51.1 (anti-CD1d) or IgG2b as a control was added to the wells at a concentration of 5 μg/ml, and the inhibitory effect of the anti-CD1d on the proliferative response of each culture was examined. 51Cr release assay was performed as follows. A total of 5 × 10351Cr-labeled cells (Na251CrO3) (Amersham, Arlington Hights, IL) from the U937 or K562 cell line as the target cells and various numbers of effector cells in 0.2 ml of culture medium were seeded onto round-bottomed microtiter wells. The culture was incubated at 37°C in an atmosphere containing 5% CO2 for 4 h, and 0.1 ml of supernatant was collected from each well. The percentage of specific 51Cr release was calculated as follows: [(cpm experimental release − cpm spontaneous release)/(cpm maximal release − cpm spontaneous release)] × 100. To evaluate the role of perforin in NKT-mediated cytotoxicity, effector NKT cells were pretreated with concanamycin A (CMA) (Wako Pure Chemical Industries, Osaka, Japan), an inhibitor of vacuolar type H+ ATPase, at a concentration of 100 nM for 2 h, washed twice with PBS, then incubated with 5 × 103 target U937 cells for 4 h in the absence of CMA (23). To evaluate the role of ICAM-1/LFA-1 interaction in NKT-mediated cytotoxicity (24), target U937 cells were pretreated with anti-ICAM-1 Ab (84H10; Immunotech) or IgG1 as a control at 10 μg/ml for 30 min, then incubated with 5 × 104 Vα24+ NKT cells at an E:T ratio of 10:1 in the presence of the same concentration of mAb for 4 h. To evaluate the role of CD44/HA interaction in NKT-mediated cytotoxicity, target U937 cells were pretreated with 20 μg/ml, 0.2 μg/ml of hyaluronidase (Sigma), or 20 μg/ml of neuraminidase (Seikagaku Kogyo) as a control for 60 min at 37°C. 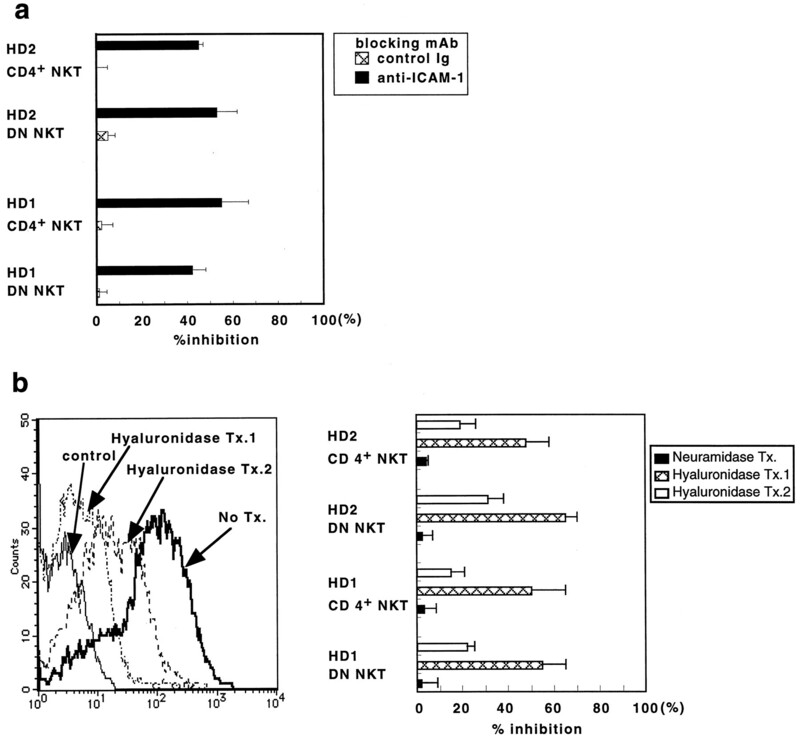 The cells were then washed twice and incubated with 5 × 104 Vα24+ NKT cells at an E:T ratio of 10:1 for 4 h.
For the cytokine production assay, 5 × 104 NKT or T cells and 5 × 104 α-GalCer-pulsed Mo-DCs (all allogeneic monocytes were derived from the same donor) were suspended in 200 μl AIM-V medium plus 10% FCS and cultured in 96-well plates. After 48 h, the supernatants were collected from each well and assayed for the concentrations of IL-4 and IFN-γ by ELISA (Immunotech). Human homologues of mouse Vα14+ NKT cells appears to be Vα24+ NKT cells. These populations are reported to be proliferated by the stimulation of α-GalCer-pulsed Mo-DCs in CD1d-restricted fashion (12, 13, 14, 15, 16). We generated Mo-DCs from healthy donors using IL-4 and GM-CSF in the culture medium, and then α-GalCer-pulsed Mo-DCs were cocultured with auto-lymphocytes to establish Vα24+ NKT cells. Based on the responses of Vα24+-sorted lymphocytes by the stimulation, three cell populations were identified in all donors: Vα24+ CD161+ CD4− CD8− NKT cells (hereafter Vα24+ DN NKT cells), Vα24+ CD161+ CD4+ NKT cells (hereafter Vα24+ CD4+ NKT cells), and Vα24+ CD161− CD4+ T cells (Fig. 1⇓). Thus, there were DN and CD4+ subpopulations in the population of Vα24+ NKT cells and almost all Vα24+ NKT cells used Vβ11 for their TCR Vβ repertoires. However, Vα24+ CD161− CD4+ T cells did not use Vβ11 preferentially. To confirm that DN and CD4+ Vα24+ NKT cells use JαQ as invariant TCR α-chain, we next performed RT-PCR on the RNA from these three populations using the Vα24 and Cα primers to analyze a fragment encompassing the V-J junction. The PCR products were electrophoresed in 2% agarose gels, and distinct bands of the size of about 190 bp were detected (Fig. 2⇓a). 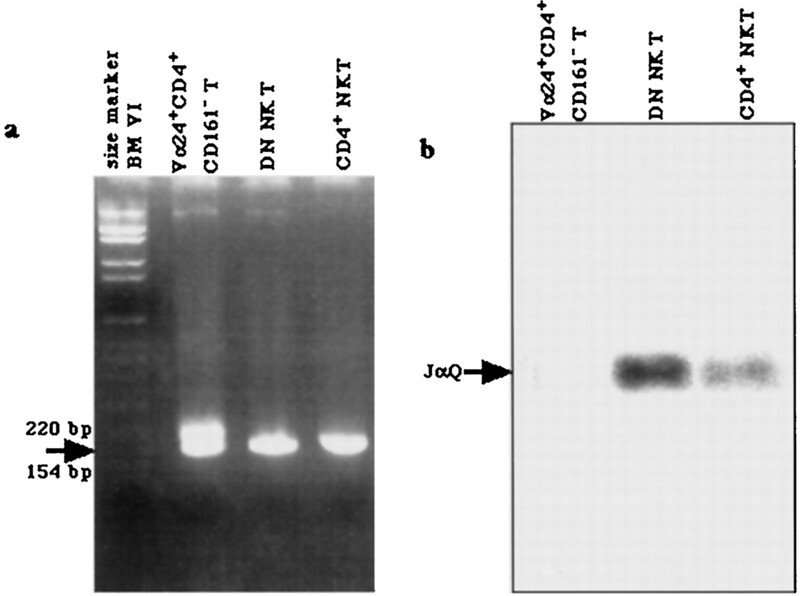 The same PCR products were fractionated on agarose gels, blotted, and hybridized with an oligonucleotide probe specific for JαQ, and the expression of JαQ was prominently detected in Vα24+ DN and Vα24+ CD4+ NKT cells although that expression was absent in Vα24+ CD161− CD4+ T cells (Fig. 2⇓b). To get additional information on the V-J junction, their nucleotide sequences were determined by direct sequence method. The Vα24+ CD4+ NKT cells as well as the Vα24+ DN NKT cells were confirmed to use Vα24-JαQ invariant chain (data not shown). 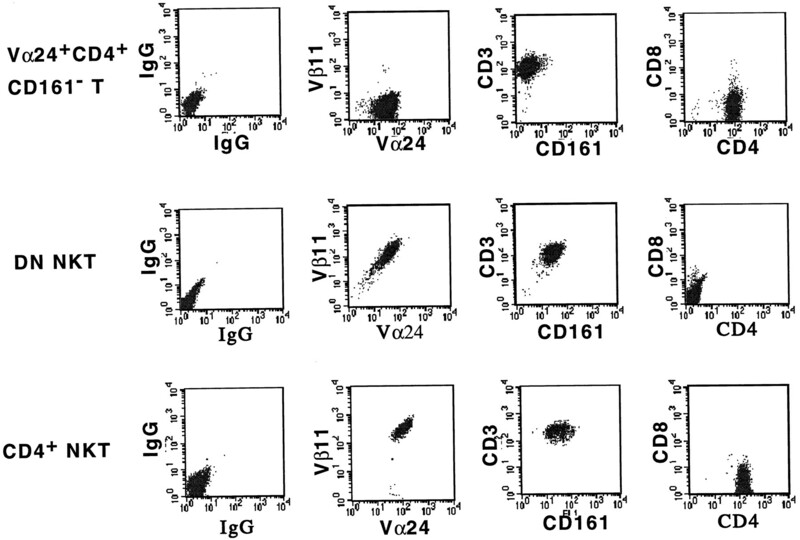 Phenotypical analysis of Vα24+ CD4+ CD161− T, Vα24+ DN NKT, and Vα24+ CD4+ NKT cell populations. PBMC from a healthy donor were cultured for 10 days in vitro with α-GalCer-pulsed Mo-DCs and then selected for expression of Vα24. The cells were then restimulated with α-GalCer-pulsed Mo-DCs and IL-2 for 2 cycles and then sorted into separated populations based on the expression of CD4 and CD161. These sorted cell populations were further expanded by two restimulations before analysis of surface phenotype by FACS. The cells were stained by two-color flow cytometry using indicated mAbs. Shown are the dot plot obtained from the first donor (HD1). Similar results were obtained in the second donor (HD2) (data not shown). JαQ expression by Vα24+ CD4+ CD161− T, Vα24+ DN NKT, and Vα24+ CD4+ NKT cell populations. Samples were from the first donor (HD1). In all samples, the PCR was performed using Vα24-specific 5′ primer and Cα-specific 3′ primer. The PCR products were electrophoresed in 2% agarose gel and stained with ethidium bromide (a). The left lane shows the size marker BM VI. The arrow indicated on the band of interest (190 bp). The same PCR products were hybridized with a 32P-labeled JαQ probe (b). Similar results were obtained in the second donor (HD2) (data not shown). Next we examined the response of Vα24+ CD4+ NKT cells to α-GalCer-pulsed Mo-DCs in a CD1d-restricted manner. The responses of Vα24+ CD4+ NKT cells as well as Vα24+ DN NKT cells to Mo-DCs were enhanced by adding α-GalCer and inhibited by the anti-CD1d Ab (Fig. 3⇓). In contrast, Vα24+ CD161− CD4+ T cells responded to Mo-DCs weakly but their response was neither enhanced by α-GalCer pulsing nor inhibited by the anti-CD1d Ab. Human Vα24+ NKT cells specifically respond to synthetic α-GalCer. [3H]TdR uptake of Vα24+ CD4+ CD161− T, Vα24+ DN NKT, and Vα24+ CD4+ NKT cell populations from healthy donor 1 (HD1) and healthy donor 2 (HD2) stimulated by none, Mo-DC, Mo-DC plus control Ig, Mo-DC plus anti-CD1d, Mo-DC plus α-GalCer, Mo-DC plus α-GalCer plus control Ig, or Mo-DC plus α-GalCer plus anti-CD1d. Cells were incubated in each condition for 48 h, and [3H]TdR was added to each well for the final 6 h of incubation. Note that in Vα24+ NKT cells [3H]TdR were more incorporated in the cells stimulated by Mo-DCs plus α-GalCer and these were inhibited by anti-CD1d mAb, but in Vα24+ CD4+ CD161− T cells these results were not obtained. Results are shown as the mean and one SD of triplicate values in this and all subsequent figures. As mouse Vα14+ NKT cells against tumor cells (17) and human Vα24+ NKT cells against CD1d-transfected cell line (22, 25) have been reported to exhibit cytotoxicity, we next examined the cytotoxic activity of human Vα24+ NKT cells. The myelomonocytic cell line, U937, was chosen as the target cells because it was the most sensitive to human Vα24+ NKT cells among the several cell lines we tested. Both CD4+ and DN Vα24+ NKT cells showed cytotoxic activity against U937 cells, although Vα24+ CD161− CD4+ T cells exhibited little cytotoxic activity (Fig. 4⇓a). However, neither CD4+ nor DN Vα24+ NKT cells showed cytotoxic activity against the erythroleukemic, NK-sensitive cell line, K562 cells (Fig. 4⇓b). Cytotoxic assay of Vα24+ NKT cells. The 5 × 103 51Cr-labeled U937 cells or K562 cells and various numbers of effector cells were incubated for 4 h. Then percentage of specific 51Cr release was calculated. Note that Vα24+ CD4+ NKT cells as well as Vα24+ DN NKT cells have cytotoxic activity against U937 cells (a) but not against K562 cells (b). To determine the mechanism underlying the cytotoxic activity of Vα24+ NKT cells, we examined the relationship between the perforin system and cytotoxic activity of Vα24+ NKT cells. The perforin system of Vα24+ NKT cells was blocked using CMA (23), and then cytotoxic activity against U937 cells was evaluated. 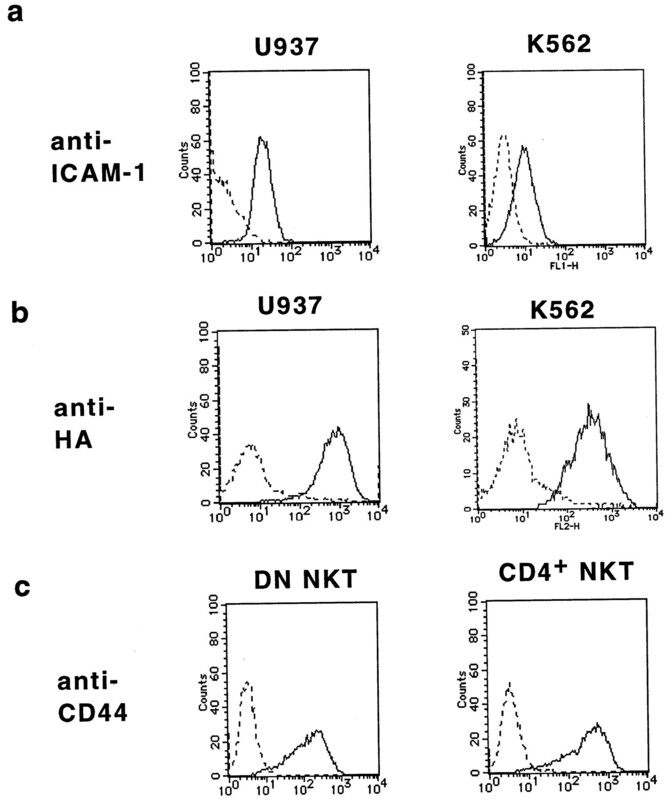 The cytotoxic activity of both CD4+ and DN Vα24+ NKT cells was distinctly inhibited (Fig. 5⇓). The role of perforin in Vα24+ NKT-mediated cytotoxicity. Effector Vα24+ NKT cells were pretreated with CMA at 100 nM for 2 h, washed twice with PBS, then incubated with 5 × 103 51Cr labeled U937 cells at an E:T ratio of 10:1 in the absence of CMA. Note that cytotoxic activity was inhibited in both DN and CD4+ Vα24+ NKT cells. As adhesion molecules such as ICAM-1/LFA-1 and HA/CD44 are known to play important roles in T or NK cell-mediated cytotoxicity (26, 27, 28), we next examined the role of these molecules. ICAM-1 and HA are expressed on U937 cells as well as K562 cells (Fig. 6⇓, a and b). To determine the role of ICAM-1/LFA-1 in Vα24+ NKT cytotoxicity, ICAM-1 molecules on U937 cells were blocked using anti-ICAM-1 Abs, and the cells were then used as target cells. 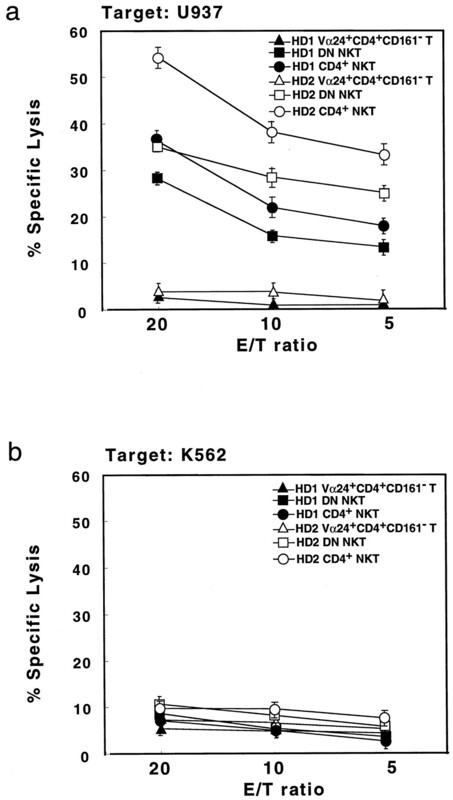 The cytotoxic activity of both CD4+ and DN Vα24+ NKT cells was inhibited by 40–55% (Fig. 7⇓a). Next, the role of HA/CD44 in Vα24+ NKT-mediated cytotoxicity was investigated. CD44 are expressed on Vα24+ NKT cells (Fig. 6⇓c). The U937 cells were treated with hyaluronidase and used as target cells. Hyaluronidase treatment did not affect target cell viability, 51Cr loading, spontaneous 51Cr release, or expression of other surface markers (data not shown). To examine the relationship between the degree of HA expression and the cytotoxic activity, U937 cells were treated with hyaluronidase in different conditions. The expression of HA on U937 cells is indicated in Fig. 7⇓b (left). In one target, U937 cells treated with hyaluronidase decreased HA expression remarkably (Hyaluronidase Tx.1), and, in another target, U937 cells treated with hyaluronidase also decrease HA expression (Hyaluronidase Tx.2) but had higher expression than the former. The cytotoxic activity of Vα24+ NKT cells against U937 cells treated with hyaluronidase was inhibited (Fig. 7⇓b, right). Moreover, the relationship between the degrees of HA expression on target cells and cytotoxic activity of Vα24+ NKT cells were observed. Phenotypical analysis of U937, K562, and Vα24+ NKT cells. a and b, The single-color flow cytometric analysis of U937 cells (left) and K562 cells (right) after staining with anti-ICAM-1 (84H10) Ab (a), and after staining with anti-HA (b). c, The single-color flow cytometric analysis of DN (left) and CD4+ (right) NKT cells (HD1) after staining with anti-CD44 (J.173) Ab. Solid line shows indicated Ab and dotted line show isotype control. Similar results were obtained in the second donor (HD2) (data not shown). The role of adhesion molecules in Vα24+ NKT-mediated cytotoxicity. a, U937 cells were pretreated with anti-ICAM-1 or control Ab at 10 μg/ml for 30 min then incubated with 5 × 104 Vα24+ NKT cells at an E:T ratio of 10:1 in the presence of same concentration of Ab. b, U937 cells were pretreated with hyaluronidase at 20 μg/ml (Tx.1) or 0.2 μg/ml (Tx.2) or neuraminidase at 20 μg/ml for 60 min and washed twice with PBS, then incubated with 5 × 104 Vα24+ NKT cells at an E:T ratio of 10:1. 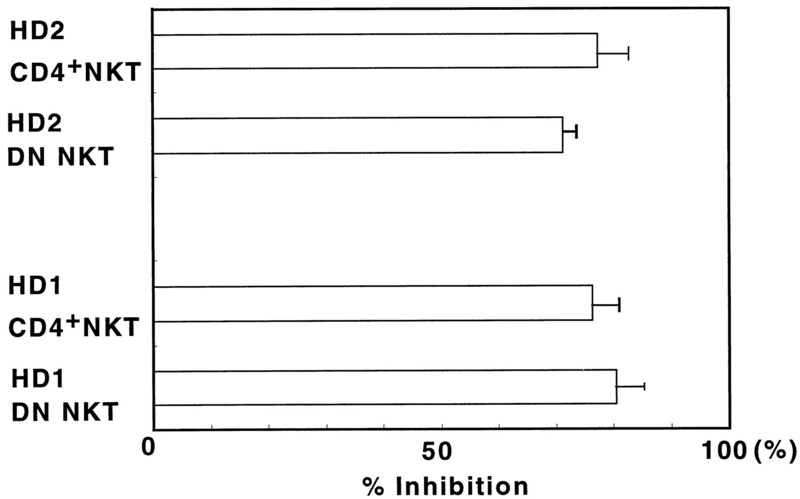 The shown graphs indicates percent inhibition rate. The left panel indicates the expression of HA by flow cytometry with or without treatment of hyaluronidase. The right panel shows percent inhibition of cytotoxicity against U937 cells. Note that in both ICAM-1 and hyaluronidase treatment, cytotoxic activity was inhibited in both DN and CD4+ Vα24+ NKT cells. As mouse Vα14+ NKT cells and human Vα24+ DN NKT cells have been reported to produce large amounts of IL-4 and IFN-γ in response to stimulation (18, 19, 20, 21), we examined the cytokine production following stimulation by using α-GalCer-pulsed Mo-DCs (Fig. 8⇓). Both DN and CD4+ Vα24+ NKT cells produced large amounts of IL-4, and Vα24+ CD4+ NKT cells had a tendency to produce more IL-4 than Vα24+ DN NKT cells. 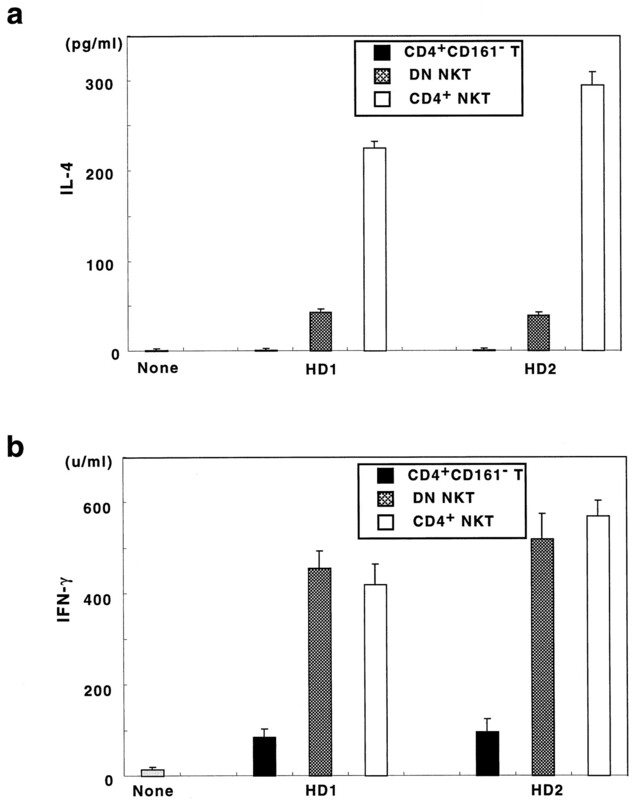 Both DN and CD4+ Vα24+ NKT cells produced almost equally amounts of IFN-γ. However, Vα24+ CD4+ CD161− T cells produced little IL-4 and IFN-γ upon stimulation by α-GalCer-pulsed Mo-DCs. Assay of cytokine production. A total of 5 × 104 Vα24+ NKT cells or CD4+ CD161− T and 5 × 104 α-GalCer-pulsed (100 ng/ml) allogeneic Mo-DCs (all allogeneic Mo-DCs were derived from same donor) were cocultured for 48 h. Then supernatant were collected from each well and assayed for the production of IL-4 (a) or IFN-γ (b) by ELISA. Note that NKT cells produced large amount of IL-4 and IFN-γ and that Vα24+ CD4+ NKT cells produced more IL-4 than Vα24+ DN NKT cells did. Recently, many reports have clarified the phenotypic and functional characteristics of human Vα24+ DN NKT cells. However, little is known about human Vα24+ CD4+ NKT cells, and, to our knowledge, only Bonneville’s group has recently reported the phenotypic and functional characteristics of these cells (22, 29). According to previous reports, human Vα24+ NKT cells (DN and CD4+) and mouse Vα14+ NKT cells exhibit many similarities. We have recently characterized human Vα24+ DN NKT cells using α-glycosylceramide-pulsed Mo-DCs (16). Here, we further analyze human Vα24+ CD4+ NKT cells by comparison with Vα24+ DN NKT cells. Phenotypically, Vα24+ CD4+ NKT cells express CD161, but not other types of NK surface markers such as CD16 and CD94 (data not shown). Almost all Vα24+ CD4+ NKT cells have Vα24-JαQ invariant TCR α-chain and exclusively use TCR Vβ11 chains, although CD161-negative Vα24+ CD4+ T cells do not preferentially use TCR Vβ11 chains. Vα24+ CD4+ NKT cells were stimulated by α-GalCer-pulsed Mo-DCs, which are known to express CD1d molecules, and their responses were inhibited by the anti-CD1d Ab. Therefore, Vα24+ CD4+ NKT cells could be considered to recognize α-GalCer in a CD1d-restricted manner. Although α-GalCer was isolated from marine sponges and has not been detected in normal mammalian tissues (12), similar Ags might also exist in mammalian tissues. Bonneville’s group reported human Vα24+ NKT cells that responded to CD1d-transfected HeLa cells not pulsed with α-glycosylceramide but not responded to wild-type HeLa cells (22), which suggested that some internal Ag might exist in tumor cells and be recognized by Vα24+ NKT cells in a CD1d-restricted fashion. Joyce et al. indicated that endogenous GPI could be one of the ligands presented by CD1d in the mouse (30). We next examined the cytotoxic activity of Vα24+ NKT cells against some tumor cell lines. Both CD4+ and DN Vα24+ NKT cells exhibited cytotoxic activity against U937 cells. U937 cells did not express CD1d, and their cytotoxicity against U937 cells could not be inhibited by the anti-CD1d Ab (data not shown), indicating that neither Vα24+ Vβ11+ TCRs nor CD1d participated in the manifestation of cytotoxicity. Previous reports have shown that human Vα24+ NKT-mediated cytotoxicity against a CD1d-transfected cell line was inhibited by the anti-CD1d Ab (22, 25). In contrast, mouse Vα14+ NKT-mediated cytotoxicity against a mouse tumor cell line was not inhibited by the anti-CD1d Ab (17). These reports considered together with our results indicate that there exist at least two mechanisms by which NKT cells exert cytotoxicity: a CD1d-restricted mechanism and a non-CD1d-restricted mechanism. In our study, the cytotoxic activity was remarkably diminished by treatment of Vα24+ NKT cells with CMA, suggesting that the cytotoxicity of CD4+ and DN Vα24+ NKT cells mainly exerted via the perforin pathway in our system. However, CMA inhibits a wide variety of cellular events, and there remains the possibility that cellular events other than the perforin pathway participate in this inhibition. Adhesion molecules are known to play important roles in T or NK cell-mediated cytotoxicity. The role of LFA-1/ICAM-1 in the binding between cytotoxic effector cells and target cells has been previously studied using a blocking Ab (26, 27). In our result, blocking Abs against the ICAM-1 of U937 target cells inhibited the cytotoxic activity of Vα24+ NKT cells. It was reported that HA expressed on the surface of tumor target cells was the main ligand for CD44 (24, 31) and that HA/CD44 binding was important for the cytotoxic activity of NK cells (28). Vα24+ NKT cells strongly expressed CD44, and U937 cells expressed HA. Thus, we hypothesized that HA/CD44 binding was also important for the cytotoxic activity of Vα24+ NKT cells. In our results, the cytotoxic activity of Vα24+ NKT cells against U937 cells was inhibited by pretreatment of the cells with enzyme, hyaluronidase, which specifically cleaves HA. Although K562 cells also express ICAM-1 (weakly) and HA, cytotoxic activity of Vα24+ NKT cells against K562 cells was very weak. We think that ICAM-1/LFA-1 or HA/CD44 binding are important for cytotoxicity of Vα24+ NKT cells, but it is not sufficient to induce the cytotoxicity in only the existence of these bindings. K562 cells are known to be sensitive to NK cells. These may indicate that the tumor target cells of Vα24+ NKT cells might be different from those of NK cells. We also tested the production of cytokines such as IL-4 and IFN-γ by Vα24+ CD4+ NKT cells compared with that by Vα24+ DN NKT cells. According to previous reports, in both mice and humans, CD4+ NKT cells produce more IL-4 upon stimulation than DN NKT cells (19, 29, 32, 33). We obtained the same result. This result is important, because not only the total cell numbers of Vα24+ NKT but also the DN/CD4+ ratio of NKT cells affects the immune regulation process that determines the differentiation of Th0 into Th1 or Th2. Moreover, the relationship between autoimmune diseases and NKT cells has been recently reported in mouse and human systems (21, 34, 35). It is possible that both these parameters (the total NKT cell number and the DN/CD4+ NKT ratio) participate in the pathogenesis of autoimmune diseases. In conclusion, we compared the character of human Vα24+ CD4+ NKT cells following stimulation with α-GalCer-pulsed Mo-DCs with those of Vα24+ DN NKT cells and determined that human Vα24+ NKT cells including both Vα24+ CD4+ and Vα24+ DN NKT cells exhibit conservation of most of the phenotypic features and functions of mouse Vα14+ NKT cells. Moreover, we showed that adhesion molecules such as ICAM-1 and HA expressed on target cells play an important role in the cytotoxicity of human Vα24+ NKT cells. We thank Dr. T. Yamagata for useful comments on the manuscript. ↵2 Abbreviations used in this paper: DN, double negative; α-GalCer, α-galactosylceramide; Mo-DC, monocyte-derived dendritic cell; HA, hyaluronic acid; rh, recombinant human; CMA, concanamycin A.
Joice, S., A. Woods, J. Yewdell, J. Bennink, D. Silva, A. Boesteanu, S. Balk, R. Cotter, and Brutkiewicz. 1998. Natural ligand of mouse CD1d1: cellular glycosylphospatidilinositol. Sciemce 279:1541.